Raz-Kids E-Reading Program for our Class! Today I stapled Raz-Kids.com login information into your child's agenda. 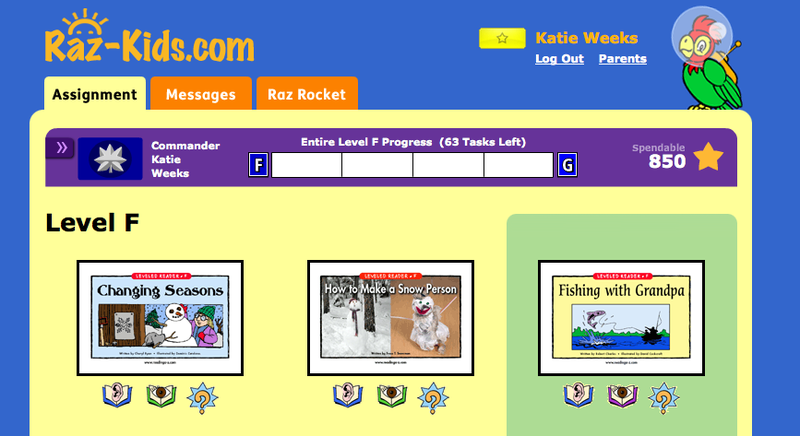 Raz-kids is an amazing web based reading program. Both my children at home use Raz-kids to supplement their at home reading. Students have the option to: listen to a book, read a book and/or take a comprehension quiz. They earn points for completing each activity which they can spend in the RAZ ROCKET ROOM. Students are assigned a level (which corresponds to their approximate reading level) but they also have access to all of the books by clicking BOOK ROOM. This service is a paid subscription which I personally subscribe to (like I said, my own children love it). Got an iPad at home? There is a Raz-Kids app for the iPad. The app is free and students can access their Raz-kids account by simply entering their login information in the app (which must be connected to the internet).